8 Years ago we embarked on a process of building the only larger fuel tank for the Samurai. Over 15 months of labor went into making our first tanks. They have been great sellers over the years. But when the mold finally committed moldacide it was time to take a hard look at the project and update it. Our New improved tank now has baffles in it to prevent the pickup tube from starving for fuel when your gas level is low on inclines. The best part of the new tank is our specially designed in tank pump assembly that accepts a stock Suzuki in tank pump (In Tank Pump Models Only). Our 15 Gallon tank gives you 50% more fuel capacity. 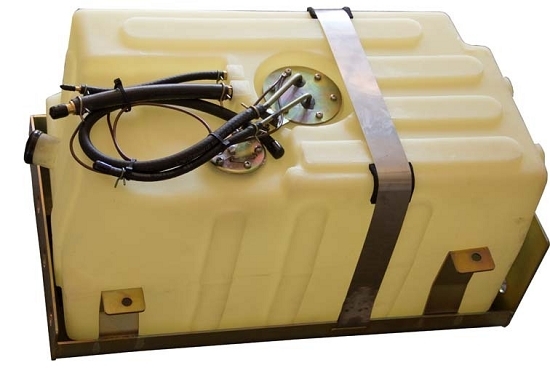 This tank is made from DOT approved Polyethylene. It will never rust or rot out. The 3/16 thick steel skid plate is Zinc plated and affords far better protection than the stock plate. Each tank includes a new sending unit and everything you will need for the installation. The tanks are available in black and natural(Pictured) colors. The natural is slightly opaque so that the fuel level is visible when you look at it. This can be very comforting when you are trying to decide whether or not you have enough gas to do just one more section of trail or if there is any doubt as to the accuracy of the fuel gauge. This tank is a direct replacement for non Fuel Injected cars. When swapping in this tank it is a good opportunity to replace the Fuel Filler Hose. NOTE: TANKS ARE BUILT TO ORDER. THERE IS AT LEAST A 7 DAY TURN AROUND TIME BEFORE SHIPPING. THIS ITEM SHIPS AS AN OVER-SIZED ITEM.